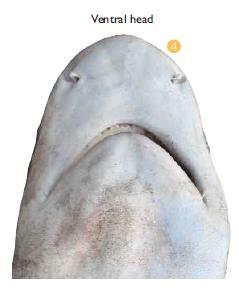 Blacktip reefshark is the most common shark creature in Morotai – as well as in Indonesia. Carcharhinus melanopterus is firstly classified by Quoy and Gaimard in 1824, are generally found in the coral reef near shore at depth 0 – 40 m. This shark is often named as guliman shark, and it also has local name in Indonesia as Hiu Mada, Kluyu Karang, as well as its national name: Hiu Sirip Hitam. 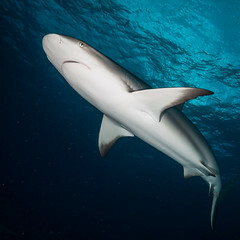 Blacktip can grow at least 1.4 m (some research have evidence of up to 180 cm length), males normally matured at 98-113 cm and females at 96-120 cm, while their puppies born at 48-50 cm. Blacktip reefshark are common in Indian Ocean, West-Central Pactific, Eastern Mediterranean. Their habitat is usually in the inner wall of coral reef. Blacktip consumes the diet of primarily fishes, cephalopods, crustaceans and other molluscs. They are known to be non-dangerous despite their fast moving skills often scares divers. Carcharhinus melanopterus is viviparous, with yolk-sac placenta, and give birth to litters of 2-4 pups after 8-9 months gestation periods, up to 16 month in some area. Blacktip reefsharks puppies are normally seen in mangroves forest or seagrass nearshore. It is classified as Near Threatened in IUCN Red List.